Direct steering input which takes away the pleasure of driving. Erstwhile Maruti Suzuki India has sold more than 4.3 lakh units of Alto K10 till date, which means that the K10 is one of their most popular models in India as of today. Going a step further, the home grown manufacturer has added an element of convenience to its new avatar by fitting in an automated manual transmission which aims to target consumers who are willing to covert to an auto gear shift given its practicality, especially in metropolitan cities wherein traffic congestion is an utter concern. At the first glance, its menacing looks towards the front make one take notice of it. In reference to its previous generation, it can be said that there are quite a few upgrades up front. To begin, these include a 3D curved bonnet which adds substance to the front fascia in comparison to the previous model which was plain and simple. Chrome finished grille with a prominent ‘S' logo sitting right in the centre further adds to the appeal, so are its pulled back headlamps which look more pronounced than before with a substantially bigger air dam. As visible in pictures, the VXi variant provided for this particular test did not feature fog lamps but they are available on the top end variant as part of the package. Its sides remain unchanged, however what has been introduced are bigger side view mirrors which blend well into the overall design of the car. The odd line running right across adds a bit of character and so does the rubber cladding which can be found on its doors. Blacked out B pillars do give the Alto K10 a sporty image along with a sloping roofline. To complete the look, there is 155/65R R13 rubber which includes plastic hubcaps. Towards the rear it is evident that there are similarities with its predecessor pointing in the direction of its tailgate. New design elements comprise of redesigned tail lights and a chrome finished line running all the way across on the lower portion of the tail gate thereby providing it a premium look. Rest for identification, Alto K10 VXi and auto gear shift badge can be found on the right side while the left has to offer Maruti Suzuki written on it with the logo sitting pretty in the centre of the tailgate. Unlike its exteriors, the interior of face lifted Alto K10 is very different to the outgoing generation. The first thing one would notice is the all new dashboard. Available in beige and black tone, the dashboard caters to a new instrument cluster with silver surrounds which comprise of a speedometer, RPM meter and digital trip computer. To give it an authentic look, the steering wheel which also happens to be a new design features silver accents. Next to this is a ‘Piano Black' finished centre console that looks upmarket for sure. It houses a music system with features such as a CD player, radio, USB and an AUX-in port. Circular knobs found right below the centre console for the purpose of air conditioning feels solid and nice. The glove compartment is decent in size. Normally in such kind of a hatch, the depth available to store things is as good as nothing but that's not the case with this K10. There is also a 12V charging point right below the gear stick, which is a well thought out feature for re-charging ones cell phone or other electronics as and when required. The cabin misses out on the all important cup holders which are a must-have feature in all cars for better storage. As for built quality, it is safe to say that it is in line with what we are used to seeing and feeling in all Maruti's be it past or present; pretty good for the price. Further, the door panels comprise of plastic inserts unlike others in the segment that offer a bit of fabric which is a first for this hatch. Silver finished door handles further help in bringing out interior design. Power window switches are now placed in the centre which is not a convenient feature. In our view, this has been done by Maruti to probably keep costs down. Moving on to its seats, they look and feel supportive but towards the harder side. There is more than decent legroom in the front when the seats are pulled all the way back. Driver and Co-passenger seats have fixed headrests with good lumber support. Meanwhile its rear seats cater to decent legroom, though headroom could be an issue for taller occupants due to its sloping roofline. Comfort wise, there is reasonable cushioning with decent lumber support. There is no storage option behind the front seats which are made of fabric. Unlike the front, there are no power window switches towards the rear, which indicates that the passengers would have to manually role them down. When compared to the previous generation, the boot space looks better on the new one and deeper for sure. Since this is facelift, mechanically there no drastic changes apart for the Auto Shift gearbox. The Alto has always been liked for its dimensions and engine capability which is why recently Maruti chose to revamp this small hatch and thus features the same K10B petrol engine as its previous generation. Magnifying its specification sheet, the new Alto K10 features a 998cc petrol power plant under its hood that produces a maximum power output of 67bhp @ 6000 rpm with 90 Nm of torque @3500 rpm. The ‘Auto Gear Shift' which is highlight of this introduction is in fact that same transmission that is found the Celerio. Revolutionary as Maruti like to call it, the transmission is based on an electronic control unit which further dives the precision Hydraulic actuator to control both engagement of clutch as well as shifting of gears. USP of this stick swift is that it insures engaging of the clutch and gear at the same time resulting in better fuel economy (24.07 kmpl claimed) and easy to drive which is no doubt. Get behind the wheel and the steering starts to feel a bit vague the moment you start accelerating. However at lower speeds the steering still feels alright. It is pretty nice to drive within the city, though the engine is very noisy which can be discomforting for occupants at all times. Another aspect to be considered is the road noise, which tends to trickle into the cabin. On the highway, long stretches could get a bit uncomfortable especially due to lack of legroom and an upright rear seat position. Handling is not bad considering what it is. Therefore it is very light and nimble when driven on city roads. 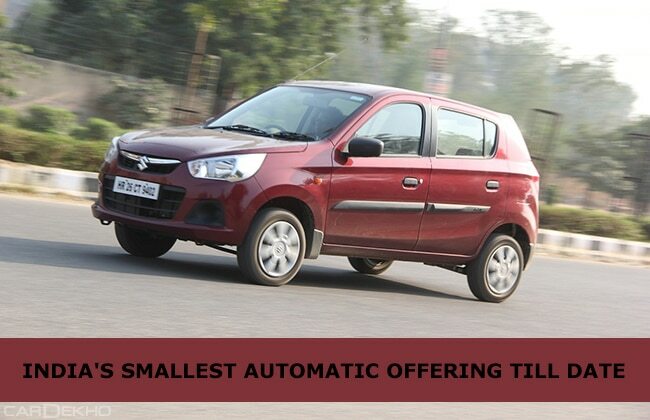 Alto K10 automatic handles potholes and broken road surfaces with utter ease thanks to its brilliant suspension setup. Inclusion of an Auto Gear Shift in the Alto K10 is a welcome move which aims to offer a sporty exterior design be it up front or at the rear. New design elements definitely lighten up its prospects within the competitive segment which also offers a cabin which is premium in appeal and is bound to attract many consumers towards it. While its engine and performance do reasonably well to put in the effort of what is it worth in reference to the price point which is Rs 3.80 lakh (ex-showroom Delhi).